As founder and executive chairman of The Saxton Group in Dallas, Kelly Saxton has taken a family approach to building a business that has opened and operated more than 100 restaurants in his 30-year career. Whether talking about his two sons, Adam and Matthew, who are vice presidents at the company, his 1,000-plus employees, or the customers and markets the franchise and development company serves, Saxton understands the value and power of connections. The largest franchisee of McAlister's Deli, The Saxton Group operates 50 of the fast casual restaurants in Texas, Oklahoma, and Kansas, and four Pinkberry frozen dessert locations in the Dallas area. Recognized by Southern Methodist University's Cox School of Business as one of the top Dallas companies for dynamic growth, the company has earned McAlister's Deli Franchisee of the Year and Developer of the Year awards numerous times. Saxton, who flipped burgers as a kid in his grandfather's diner in South Hutchinson, Kan., hails from generations who have worked in the restaurant and food business. Still, the fresh-faced college graduate wasn't thinking much about his roots when seizing an opportunity from his father and a family friend in 1982 to become a Mazzio's Pizza franchisee in suburban Jackson, Miss. "Honestly, at that time, I'm 22, married and have a child. I wanted a job," says Saxton. Soon, he was hooked by the people and the multifaceted nature of a business that requires marketing, financial, human resources, and retail know-how to succeed. "We are in a business where you are measuring impact--moment-to-moment, customer-to-customer," says Saxton. "I thrived off the energy and still do today." By 1999, Saxton owned more than 50 Mazzio's locations in Mississippi, Arkansas, and Texas and was on the hunt for a growth-oriented concept that wasn't as commodity-driven as a slice of pizza. He was drawn to McAlister's varied menu, which includes soups, salads, and spuds, the concept's appeal to women, a strong daytime presence, and a focus on service. He sold his pizza operation in 2004 to concentrate on developing the McAlister's brand, particularly in Texas, the company's best-performing state. In 2009, Saxton added the upscale Pinkberry Frozen Yogurt to his portfolio, the first Pinkberry franchise awarded outside of California and New York. Five years ago, when we profiled The Saxton Group (then called Saxton Pierce Restaurant Corp.), it already was the largest McAlister's franchisee, with 30 units spread across Texas, Oklahoma, Mississippi, and Kansas. Late last year, Saxton's organization got even bigger with an acquisition that added 20 McAlister's in Oklahoma, Kansas and Missouri. That acquisition--of Bothwell Saxton Restaurants, a company in which The Saxton Group had been a partner with Craig Bothwell--brought the Saxton Group's number of McAlister units to 50, with sales expected to reach $100 million in 2013. Saxton said he plans to add five or more McAlister's locations a year. Along the way, sons Adam and Matt joined the company, working their way up through the ranks to their current positions as vice presidents. Both grew up in the restaurant industry, starting as teenagers. Adam, a graduate of SMU, focuses his analytical skills on long-term strategic real estate plans and brand positioning. Younger brother Matt, who earned his degree in hospitality management from the University of North Texas, works closely with vendors, architects, and contractors involved in new restaurant construction. So how do the Saxtons, who often dine, work out, and vacation as a family, work and play so well together? "We can disagree and at the end of the day we are friends who have a healthy respect for each other," the elder Saxton says. "It is most important to us--my wife and me--that we have the family dynamic first and business is a by-product... and there is always their mother to keep us in line." At 52, Saxton has no plans to go anywhere but up, though he did transition in late 2011 from president to executive chairman to focus on strategic planning and long-term strategy. 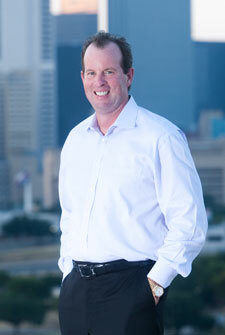 Kirk Lanier, who was a general manager for McAlister's before joining Saxton in 1998 to help expand the brand, was named company president. The restructuring has allowed Saxton to step away from daily operational duties and focus his leadership and energy on the company's big picture future. "We have a very successful management team in place and we will continue to grow," says Saxton. "This also allows the team to grow and have longevity from that standpoint. For me, I've had this position for 30 years. It's not like I just showed up." No matter where the development road takes the company, Saxton believes in developing brands within markets they know and understand. For Saxton, the aim is to be a "people-centered" business that connects with its employees, rather than just a company that operates a brand. "If you are going to be a franchise company--which we are, and we love being a franchise company--you don't want your company to be just about your brand, because if that brand goes away, potentially your company goes away," says Saxton. "I want to be involved with my company forever. From an organizational standpoint, through people, you are managing the brand, but they are working for the same company, The Saxton Group. This is where they hang their hats, and we want them to be positive about this brand." I flipped burgers at my grandfather's diner in South Hutchinson, Kansas. I guess that means that I've been in the restaurant business my whole life! I come from several generations who have worked either in restaurants or in the food industry. I really have focused on creating a strong identity for The Saxton Group that goes beyond the brands we operate, and I feel like that's been a key accomplishment. Many franchisees associate themselves very closely with the brands they operate. but we want our people to think of themselves as part of The Saxton Group team first. Investing deeply in our own organization allows us to grow quicker, perform at a higher level, and create opportunities for our people. I've never heard of a smart mistake. If I made mistakes along the way, I'm sure they weren't smart ones. With 20/20 hindsight I could have made a lot of decisions differently, but that's not what will take our business to the next level. I've never spent a lot of time on mistakes. I'm a wake up and do my very best that day kind of guy. Whatever it takes! I've assembled an incredible team that have taken much of the day-to-day responsibility for the business out of my hands, but that doesn't mean I find myself working any less! I'm able to focus on areas where I believe I can have the biggest impact, like strategic growth, the occasional acquisition, and developing other leaders in our organization. I'm an early riser and work on my iPad from my kitchen in the mornings. I make my own protein shake that I drink every morning! I usually arrive to the office around 9 a.m. and dive into reviewing sales results from the previous day. I have lunch with my management team every day, and some of our best ideas come out of those lunchtime discussions! I spend a lot of time on the phone discussing our business with the leaders of our franchise brands and business partners. I enjoy working out, dining out, collecting red wine, especially Pinot Noir, and spending time with my family. I work out nearly every day at the Cooper Fitness Center in Dallas and do a variety of cardio and weights. I use a personal trainer there several times a week. I've also come to really enjoy Pilates, something my wife and I do together. Hands down, my iPad. I also really enjoy the Jambox speaker from Jawbone. I'm sure I'm not the first one to say this, but people around my office quote me as saying, "Slow don't pay!" That means it's the restaurant business. We're supposed to be busy, we want to be busy, we better be busy. Get started. Do something. Make it happen. Nothing is going to happen just because you want it to. Take steps, any steps, to get started. I enjoy my work, I enjoy my family, I enjoy our employees. I'm happy to report that I'm all-around happy, and that makes taking on each new day pretty easy. Growth. I am most thrilled when I am growing our company, and that creates opportunity. I consider my position the Chief Executive of Creating Opportunity. Seriously, I draw so much knowledge and information from sitting down and having lunch with members of our team at The Saxton Group. Sure, there are plenty of people who could be interesting to have lunch with, but I'm lucky enough to have lunch nearly every day with a group of people I honestly find interesting and engaging. You get what you expect, so set your expectations high. Stay focused. I believe in empowering other people to do a great job. I've never been a micromanager. Set expectations high and then let your team go out and exceed those expectations. Not just meeting, but exceeding our customer expectations every single time: 100 percent customer satisfaction in 54 restaurants in four states 365 days of the year. Intense, fair, hard-working, and honest. I'm always looking for more patience. You can never have enough of that, and I hope to continue to evolve into a more patient person. I believe in independence. We're all driving to the same place, we all have the same goals. If your idea is better than mine, let's do your idea. I hear feedback directly from our stores on a daily basis. In the restaurant business if you lose touch with your restaurants you probably won't be in the restaurant business any more. Three D's: Development of the concept, Define where our brand stands, and Distribute it across our territories. The same level of customer satisfaction that we strive to deliver to our customers. We aren't happy until we exceed the customers' expectations in our restaurant, so I hope our vendors aren't happy until they've exceeded our expectations. I need business partners, not just vendors, who are engaged in growing this business together. Have you changed your marketing strategy in response to the economy? We've tried to be more specific and target our customers closely. It's a huge benefit to have more communication with your customers and your employees. We see the social channels as another way to have dialogue with the people who make us successful: our customers and our people. We retain people by giving them opportunity to grow. If I'm not creating upward advancement for the people in our organization then I'm not doing my job. Make a commitment that you don't meet. In excess of $100 million in sales in 2013. By how successful my people are. If I see more and more people on our team having success I know we must be growing. If I see us hiring new people, opening new stores, and advancing careers I know we are growing and I know we are doing something right. Five years: over $150 million in annual revenue. Ten years: personally happy and in a great place. Are you experiencing economic growth or recovery in your market? Growth. We're doing business in great places. What we didn't do is use the economy as an opportunity to do anything differently when it comes to our philosophy of taking care of our people. Capital is always available to successful companies. Whenever we've had success we've found the money to fuel our success. In periods where we were less successful money was difficult to find. That's probably always going to be true. I'm trying to run our company the very best it can be so it's ready when that opportunity presents itself.